For the first time since the last game of the 2007 ALDS, Joe Torre will be in uniform for a Yankees game. Of course, Torre will be wearing the home whites of the Los Angeles Dodgers as he faces his old team for the first time in his managerial career. 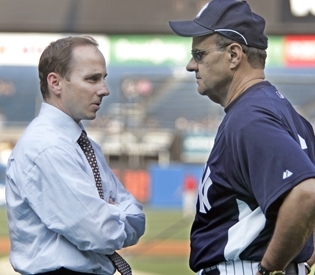 Brian Cashman and Joe Torre used to enjoy a strong working relationship with the Yankees, but have since become estranged after the publication of The Yankee Years. Whether you believe Torre was shafted or allowed arrogance to end his Yankee career, the acrimony surrounding his departure has been examined to death. Like most ugly divorces, there are two sides to the story, so there is little purpose in trying to determine the aggrieved party. Doing so usually opens wounds wider and makes the healing process take that much longer. Unfortunately, that is precisely what has resulted from last year’s publication of Torre’s book, The Yankee Years. As much as Torre has tried to deflect any notion that his book was deeply critical of those who helped him resurrect his career, Brian Cashman has made it very clear that he views some of the statements in the book as a form of betrayal. Torre’s attempt to portray himself as a victim and shift blame for the Yankees’ post season failures during the end of his tenure have understandably left a sour taste in the mouth of many Yankees executives, including Cashman and Hal Steinbrenner. According to many accounts, Steinbrennernot only resented the way Torre portrayed his final contract offer, but was particularly insulted by his lack of gratitude for the opportunities presented to him by the organization. Complicating the relationship even further is the special bond that the Yankees’ “core four” have with Torre, a warm feeling that is in stark contrast to how Alex Rodriguez feels about his former manager. While Jeter, Posada, Rivera and Pettitte have all spoken glowingly about Torre, Arod has refused to offer a comment. Of course, his silence speaks volumes. Because of Torre’s decision to write his book so soon after departing the Yankees, what should have been water under the bridge has instead bubbled beneath the surface. Being a master of the media, Torre will likely brush aside some of his less than flattering comments about Cashman and Arod, but the fact remains that they were petty and petulant. You can’t blame either man for not opening their arms to a Torre reunion. The Yankees can’t erase Torre from their history and it clearly isn’t their intention to do so. Torre’s number six has not been issued over the past three seasons and it likely will remain vacant until it is retired in his honor. Whether Torre is every fully welcomed back into the Yankee family remains to be seen, however. In a weird twist, the organization’s posture is oddly similar to the one taken by Yogi Berra after his untimely dismal as Yankee manager in 1985. Just as Yogi vowed never to return to Yankee Stadium, it seems as the Yankees have no desire to have Torre come back either. Perhaps Torre would be wise to follow George Steinbrenner’s lead and issue a long-in-coming apology that will help begin to repair the rift? With all of the friends he cultivated in the media, Torre has always been able to count on more than his fair share of positive press. Still, the fan base has slowly started to sour on Torre, especially after the team proved that they could win a World Series without his leadership. As a result, if tonight’s game was played at Yankee Stadium, the crowd response would feature a healthy portion of jeers. Instead of a heroic return, Torre may never be welcomed back at all. Could Hal Steinbrenner and Brian Cashman be the bigger men and let bygones be bygones? Sure, but in this case, the burden on the apology falls squarely on Torre’s shoulders. Until he takes the first step, the honors that Torre deserves will be put on hold. To this point, Torre’s pride and stubbornness have won out over his affection for the Yankees and desire to take his rightful place in the team’s history. There may be lots of hugs on the field before these next three games, but regret is the real emotion that will be flowing.